I always think that when I’m on a cruise I’ll be able to catch up on all the writing projects that I‘m behind on. But somehow that never happens. Every ship is full of distractions and unusual forms of entertainment designed to keep the crowds coming back. And so far it has been working very well on me. With 27.2 million passengers projected for 2018 and only 20% of US citizens having ever taken a cruise, there is an enormous untapped market left to conquer. The industry has seen 2100% growth since the 1970s, but that’s still only the tip of the iceberg. As connectedness improves, suddenly the sky is the limit for competing with inland resorts. Here are a few near term trends that will set the stage for longer-range ideas to take root. Pushing the Envelope Experiences. Island hopping is so yesterday. Next generation cruisers will be looking for that unique one-of-a-kind experience to tell their friends about. Whether its underwater caving, or playing with swarmbots, or eating dinner made from glowing energy balls, or sleeping on touchless airbeds, future tech is where our next-gen cruisers live. Multigenerational cruising is projected to increase in popularity in 2018 and beyond – but with a twist. More grandparents and grandchildren will travel together, but without the parents. Health and wellness cruises are on the rise. Travelers are seeking health and wellness experiences for the mind and body. Today’s cruise travelers can participate in on-board health wellness seminars led by popular health experts, custom fitness programs, stress management and spa services. From ‘Braincations’ to Working Vacations. Future cruises will span the spectrum from super connected to the super unconnected with some going so far as to billing themselves as “interventionist retreats” with 12 step programs to help cure those suffering from severe online addiction. No longer warm weather only cruises as colder climate destinations like the Baltics, Canada, Alaska, and Antarctica are becoming more appealing. With unusual excursions ranging from penguin watching to ice fishing, these regions are drawing both new and repeat cruise travelers. A cruise for any budget. Even though the average age of today’s cruise passenger is over 50 years old with a median household income of $109,000, a recent survey showed 33% of those who took a cruise within the past 3 years have a household income of under $80,000. 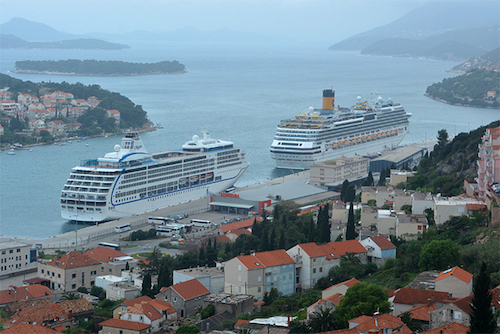 Ocean cruises add more capacity than river cruises. As the industry grows, cruise lines will invest more heavily in ocean-going vessels which attract younger generations. In the next nine years, investment into riverboats is expected to fall to nearly zero. Increase in Smart Travel Technology – The coming year will see a rise in traveller-friendly on-board technologies. Several cruise lines are introducing wearable technology for cruise guests that will provide a personalized and seamless experience on board. As new things get added to ship, many older features will disappear. 3. Gambling – With the rise of artificial intelligence, gambling, in it’s current form, will not survive. Over time, terms like virtual reality and augmented reality will disappear. Mixed reality is the merging of real and virtual worlds to produce new environments and visualizations where physical and digital objects co-exist and interact in real time. 26. AI sleep-optimizers will control all of the environmental factors – heat, light, sound, oxygen levels, smells, positioning, vibration levels, and more. 59. Self-filling water bottles with built-in atmospheric water harvesters. One possible game changer for the cruise industry will be floating islands. Started in 2008 as a libertarian approach to opting out of traditional governance, the Seasteading Institute is targeting 2020 as the launch date for a floating city off French Polynesia, where it hopes to use a “start-up” ethos to eventually create a climate-friendly, small-government alternative to land-based nations. Working with the French Polynesian government, it will begin construction on the first of 15 floating platforms. The domed, greenery-filled platforms will each be roughly the size of a baseball diamond, and can be rearranged to connect to different points on the floating city’s framework. The first “city” is expected to house approximately 300 people, but the ultimate goal is to bring in people from various countries to found new, ocean-based nations. While the launching of island nations is on the other end of the spectrum of today’s luxury cruise industry, there will be an obvious meeting of the minds as floating city technology matures. Modern cruising is a relatively new industry with most of the modern ship designs starting in the 1970s. Look for cruise ports to become a country vs. country status symbol as economic development groups offer incentives for cruise lines to offer more routes that include their city. As the average age of passengers drop and cruise lines attract more working executives, companies will view these ships as a fresh channel for introducing new products. Whether its food products, household gadgets, internet of things devices, software, hardware, or something else, people are continually fascinated by cutting edge products. This will open the doors for sponsorship arrangements with companies who otherwise have little connection to the cruise industry.